I’m just going to throw this out there; in photographic conversations, focal length doesn’t mean what most think it does. Moreover, it almost never means what the optical engineers means when they say focal length. I’d even go as far as the say the real meaning of focal length is one of the dirty secrets in photography. The optical definition of focal length is a measure of how strongly an optical system bends light. The shorter the focal length, the more strongly the lens bends light, the longer the focal length the less the sharply the light is bent. That’s it, full stop. If you look at the diagram to the right, that is all that there is. There’s no camera, no frame and no subject. You can substitute any numbers you want for the focal lengths it doesn’t matter. 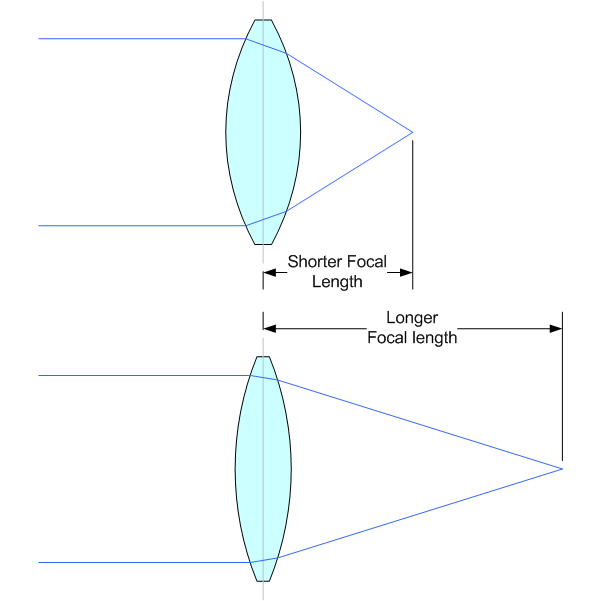 Focal length is a property of the lens and only the lens. The only way to change it is to change the lens somehow. A zoom lens does this by rearranging parts of the lens, thus changing the lens and the focal length. Likewise, a teleconverter can be thought of as creating a new lens that is the original lens + the teleconverter that has the focal length adjusted by the teleconverter’s power. Placing a “crop” sensor behind the lens, however, does not change the lens and therefore the focal length stays the same. The trouble with focal length is that it doesn’t tell us anything useful about the image the lens will produce. As an exercise, ask yourself this, what is a 50mm lens? If you said it’s a normal lens, that produces an image similar to what you normally see, you’d be right and wrong too. Put that lens on a 4/3rds camera and you have a telephoto lens, put it on a medium format camera and you have a wide-angle lens. The focal length is the same, but the angle of view is different, and so is how the lens is used. This is why I say focal length in the optical sense, is largely a meaningless number for photographers. We don’t work around how much a lens bends light, we look at a scene and want to fill the frame we have with some composition. To put a technical word to this, what we’re interested in is the field of view. Field of view is certainly related to focal length, but it’s also related to the size of the frame that’s capturing the image. If the field of view changes because we change frame sizes, the natural response isn’t to allow our composition to change, but to change the focal lengths or move the camera to restore the composition to the way we wanted it. This is the dirty secret: When photographers talk about focal lengths, they’re really talking field of view not how much the lens bends light.